As more of our friendships become virtual via online communities, what happens when those virtual friends die in real life? Today, I’m excited to host the creator of Navigating Cyberloss, a truly innovative and genuinely supportive website for an exponentially growing segment of people dealing with grief from the death of online friends. 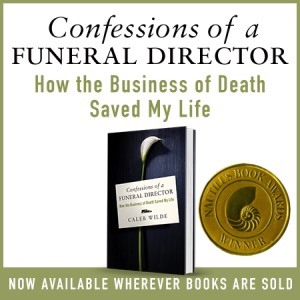 Casey is years ahead in recognizing the changing landscape of both grief and funeralization. Here’s the story that prompted the creation of Navigating Cyberloss. Those were the first five words I wrote to Chris Thomas in February 2006. She was a devoted fan of George Harrison, as I am, and it was through the official George Harrison fan forum that we met. That day in February 2006 happened to be the twenty-fifth, which would have been George Harrison’s 63rd birthday. We fans were taking part in a virtual celebration for him, during which a moderator had offered some ‘banoffee pie’. Chris wasn’t sure what banoffee was, and I wasn’t 100% certain, but I offered my best guess, and she appreciated it. We stayed in contact for a while through her forum thread, and then began to exchange emails and instant messages on a regular basis, communicating almost every night. Even though she lived in Argentina, she became one of my dearest friends. Through reading Chris’ posts on the forum, I became aware of her battle with cancer. Although it was one of the most difficult experiences I had ever faced I remained supportive, offering what little assistance I could through our conversations and helping her get back into playing guitar, a skill that she passed on to her son. At times when Chris’ health prevented her from updating the community on her condition, other users would keep in touch and pass any news on to us. There was an air of loving support which was present in all contact that the forum members had with Chris, and we all hoped against hope that somehow she’d beat it. The third of April brought confirmation of what the board community had dreaded, when one of our members wrote that he had heard from her brother that Chris only had a few days left. Personally, I think knowing that bad news is coming sometimes makes it harder to bear.. That first night of knowing was spent wishing for sleep and praying that if it had to be that way, it would be painless. The next morning, I participated in a communal playing of ‘My Sweet Lord’ – Chris’ favourite George song, to show her, in spirit at least, that we were thinking of her as she made her way Home. Easter Sunday, April 8 2007, was also the day that Chris passed away. Due to time differences, I didn’t hear until the ninth, the day I woke up and knew without a doubt what had happened. It was just before 7.15am when I logged onto the board, and read the news. I was far from prepared but somehow knew what I had to do. I played George Harrison’s song ‘All Things Must Pass’ and thought lovingly of the person I’d had the privilege of knowing for an all too short period of time. I grieved deeply for two years afterwards, and grieve to this day. Somewhere in the midst of my discomfort, I searched for assistance in dealing with the loss of online friends, and found nothing which discussed what I was trying to comprehend. In November 2010, I started the blog Navigating Cyberloss to fill that gap, reasoning that I couldn’t possibly be the only person who had experienced meaningful online friendship, and devastating online loss. The blog is intended to provide community and support for people who have endured similar losses, offering them a place to share and remember with others who have suffered in this way. It is my hope that cyberloss will become a recognised issue which can be legitimately discussed alongside other types of loss, ensuring that those affected do not experience the same isolation I felt at first. Follow Casey on twitter and send your love via a “like” on facebook. This entry was posted by Caleb Wilde on April 24, 2012 at 12:35 pm, and is filed under Cyberloss, Guest Posts. Follow any responses to this post through RSS 2.0.You can leave a response or trackback from your own site.